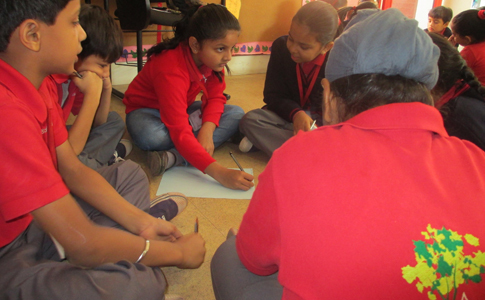 ASSESSMENT - AS A MOMENT OF LEARNING at Redbricks School Ahmedabad. Assessment at Redbricks is 'for' the child and not 'of' the child. At Redbricks, we believe in and follow a continuous and comprehensive assessment system. This means that assessment is not limited to examinations but it happens throughout the year and in multiple ways to get a realistic perspective of each child's performance and development. Assessment is an integral part to teaching and learning and is used to monitor the learning process and ascertain achievement in each area of the curriculum. Through the assessment procedure, the teacher is able to gauge the child's short term and long-term needs in the learning process and plan her actions for future improvements. The primary purpose of assessment is to understand where children are currently in their learning and use this knowledge to help them move forward. Assessment also involved self-assessment by children, which helps them to reflect and get a realistic perspective of their strengths and weaknesses. It motivates them to take ownership of their own learning and improvement. In an education system that has been witnessing the burden, pressures and downsides of over-assessment, we as educators and parents need to take an approach to make assessment productive rather than counter-productive for effective growth of children.